Apple announced that it would apply for planning permission from Galway County Council to build a data centre on a greenfield site in Derrydonnell, near Athenry. It is estimated that it would cost €850 million to develop the site, and between 100 and 150 people would man the centre upon its completion. The site covered a space the size of about 23 soccer fields. 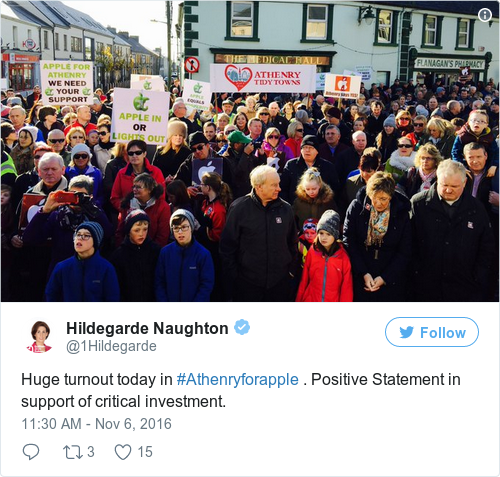 It would be the single biggest private sector investment in Connacht, and was welcomed by many locals. Galway County Council said it needed more detail from Apple about its plans. It was intended that the centre would be completely powered by renewable energy. The council was concerned about how this would work. Almost immediately objections were lodged with An Bord Pleanála by eight objectors. Most complained about the negative environmental impact the data centre could have. The case was fast-tracked and is due to be heard in the Commercial Court in March. After Justice Paul McDermott reserved his judgment in March, it was anticipated that a final decision would be made on the project near the end of June. This was delayed again, and a ruling was expected at the end of July. In the meantime, Apple announced that it was building a second data centre in Denmark. This followed its completion of its first data centre in the country, plans for which were announced on the same day as the centre in Galway. The decision was postponed again, and is now scheduled to be heard on 12 October when it is expected that a final judgement will be delivered.